Opening its doors in 1993, The Biggs Museum of American Art quickly became one of the most important museums in Delaware. The Museum was founded to display the art collection of its founder, Sewell C. Biggs (1914-2003), and to delight and educate its visitors on the valuable cultural legacy of the region. 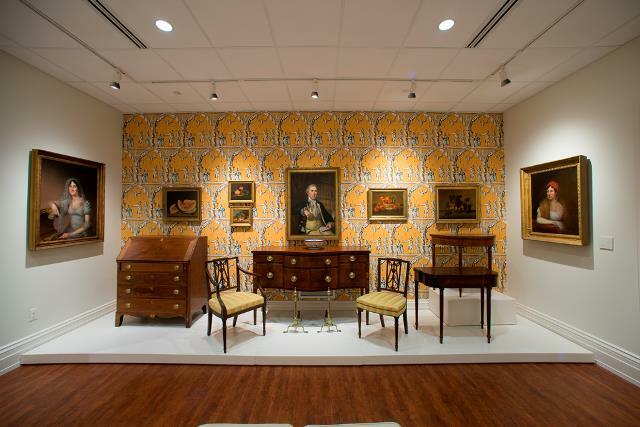 The Museum displays the finest Delaware-made furniture and silver collection as well as the only painting and sculpture collection in the region able to track the history of American representational art. The Museum’s twenty five galleries are arranged to emphasize the evolution of Mid-Atlantic fashion in the fine and decorative arts from the early 1700s to the present and to present several focus exhibitions annually. Art education is at the core of the Biggs Museum’s mission and opportunities to experience the Museum in different ways are offered throughout the year. The Biggs Museum of American Art is located at 406 Federal Street in downtown Dover, Delaware. Early supporters of the Biggs Museum, Delaware’s former first lady Elise DuPont and Senator Nancy Cook, helped carve a gracious niche within State government to hold this unique, private museum. Since the 2003 death of its founder, the Biggs Museum continues to expand and refine its permanent collection along the path carved by Sewell C. Biggs. His interest in displaying the symbols of regional, artful spaces alongside his fine-art teaching collection is maintained in every new accession. Sewell’s life-long passions of collecting, architecture, American and regional arts, and modern-art patronage are combined and presented in the Biggs Museum. The result is a museum founded to define the artistic life of the entire State of Delaware. Born on November 12, 1914 in Middletown, DE to J. Frank and Emma L. Biggs, Sewell’s family was economically and geographically tied to Delaware and the Mid-Atlantic Region through an illustrious history of lawyers, bankers, farmers and politicians. 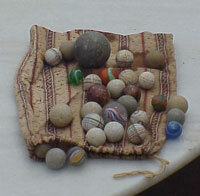 Among the 100s of art objects and archival materials Sewell left to the Biggs Museum, were some of his earliest personal items, such as a bag of marbles. It was often discussed that Sewell opened his first museum in his childhood bedroom where he charged visitors a nickel to see his collection of marbles, seashells, Confederate money, WW I artifacts, and illustrations from American Boy magazine by Wilmington illustrator Frank Schoonover. Among the earliest antiques Sewell collected was a chest of drawers probably made in Cantwell’s Bridge, now Odessa, Delaware in the late 1700s. Other art forms that Sewell grew up around include this Philadelphia looking glass (1815-30) that hung in the main parlor of his childhood home and descended from his father’s family. He also inherited a mahogany veneered butler’s desk and a set of three portraits by James Van Dyck (all ca. 1825) of his mother’s New Jersey ancestors, the Beekmans. During his teenage years, Sewell often accompanied his mother and family friend, Mary C.W. Lewis, on antique-buying road trips through the Pennsylvania and Delaware landscape. 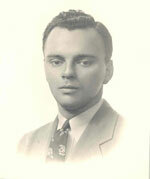 Sewell Biggs expanded his horizons with education, travel and real estate. After following in the family footsteps and passing the Virginia Bar exam, Sewell immersed himself in the study of architecture at Oxford and Cambridge Universities. He and his friend, Charles DuPont, spent 1937 traveling around the globe photographing major architectural structures and cultural rituals. Sewell’s own photograph albums attest to his respect for the genius of each culture’s architectural heritage while also embracing the new visual vocabulary of modern building. At the end of World War II, modern architecture was heavily embraced by the new world power of America and architects like Mies Van de Rhoe, Walter Gropius, Frank Lloyd Wright, and Le Corbusier were spreading an electric influence. 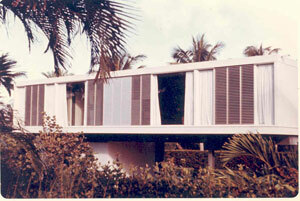 Apparently, Sewell was so taken with the new architecture that in 1958 he built an International Style vacation house in DelRay Beach, FL designed by recent Yale graduate, Paul Rudolf. It may seem surprising that a man with a distinct respect for early America would also love American modernism, decorating his new house with a conspicuous lack of antiques and selecting furniture by renowned designers like Hans Wagner, but again Sewell’s collecting interest spanned the finest examples of art from all periods of American history. As another example, when Sewell bought an apartment in Manhattan, the interior was decorated with Mid-Atlantic federal-period furniture. At this same time, Sewell began buying and refurbishing 18th-century farmhouses throughout New Castle and Kent Counties here in Delaware. These historic settings became the first personal displays of his growing collection of Americana. 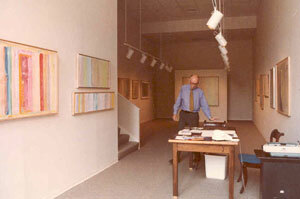 In the 1970s, Sewell began collecting representational American paintings and sculpture. Together, the fine and decorative art collections became a valuable tool to demonstrate the major movements in American art from 1700 to the present. While Sewell was exploring, and collecting 18th- and 19th-century Mid-Atlantic art forms, he began a long series of relationships with area non profits serving on the Boards of the Grand Opera House, the Delaware State Arts Council, the Delaware Art Museum, the Historical Society of Delaware, the John Dickinson Society and chaired a committee for a major restoration of the 1768 Old St. Anne’s Church of Middletown. He was a member of Winterthur, Yale University Art Galleries, the Metropolitan Museum, and the Art Institute of Chicago. At the same time, he began progressive support of Delaware Valley education with large levels of funding to area schools including the University of Delaware, endowing an Americanist position in the Art History Department, as well as the formation of the Choptank Foundation Scholarship Program hosting Scandinavian students for a year of study at U of D. Sewell opened the Grand Gallery at the Wilmington Opera House hosting monthly exhibitions of area artists, several of the works from these exhibitions made their way to the Biggs Museum permanent collections, and its offices, and displays Sewell’s patronage of the local art scene. Sewell Biggs’s artistic interests culminated in the display of his collection in the museum’s galleries. Sewell sought to create a series of galleries, organized on a timeline, that balanced painting, sculpture, architectural elements, furniture, silver and metals, ceramics, and textiles to highlight the important formal qualities the arts shared in the Mid-Atlantic since 18th century. The Biggs Museum continues to grows to accommodate new gifts and purchases that deepen the visitor’s understanding of the Museum’s timeline. Sewell added the earliest documented chairs by a Delaware maker, unique examples of Delaware tall-case clocks by some of the finest craftsmen of Early America and examples of Mid-Atlantic 19th-century furniture. Sewell’s painting collection includes important examples of early-Delaware portraits, 19th- and 20th-century American Impressionism, works by artists of the Hudson River School of American Landscape Painting, early works by instructors and graduates of the Pennsylvania Academy, Brandywine River School Illustrators, fine examples of 20th-century Delaware Modernism, living regional artists, and little-known folk artists of Delaware’s past. By 1998, the Biggs Museum launched a temporary feature exhibitions program of lending and borrowing works for special concentration shows based on areas of the permanent collection. Today, the Museum creates landmark exhibitions on diverse topics of the American art scene. Highlights include exhibitions on Thomas Cole, Delaware needlework samplers, Frank Schoonover, the Janvier Family of cabinetmakers, John Hesselius, early Delaware chairs and blanket chests, Edward Redfield, early Delaware clocks and silver, and contemporary artists and artisans from the region. Alongside these exhibitions, the Biggs Museum began publishing important catalogues including its own two-volume collection catalogue, Almost Forgotten: Delaware Women Artists and Art Patrons 1900-1950, Delaware Clocks, Delaware Silver: the Col. Kenneth P. and Regina I. Brown Collection, Greetings from Delaware: The Jann Haynes Gilmore and B. Joyce Puckett Collection of Artist Greeting Cards and many more to come.